Two-Wheeler & Four-Wheeler owners and drivers across the country uniformly carry one piece of document in their and that’s their driving license. The same is with registration papers of the vehicles in the car. They are of utmost importance when you are traveling on the road. However, at one time or the other most of us have forgotten these documents at home or always worry about misplacing it. But, that will soon be history – infact, now you will never need to carry them physically with you as the Government has now come up with integration of these documents with their cloud backup solution – Digilocker. Digital Locker was launched by Narendra Modi Government in 2015 – The locker, it was proposed, would be linked to the Aadhaar card of citizens and would then enable them to store all their government issued documents (right from birth certificate to degrees) on the cloud storage system. The documents thus stored in the digital format can be accessed by the users of the facility by using their Aadhaar numbers. Uploading your driver license and Registration papers on DigiLocker is very simple – If you have not already, just download the DigiLocker App on you Mobile phone. Sign up and create your account on Digital Locker with with your mobile phone number. Your mobile number will be authenticated by sending an OTP (one-time password) followed by selecting a username & password. 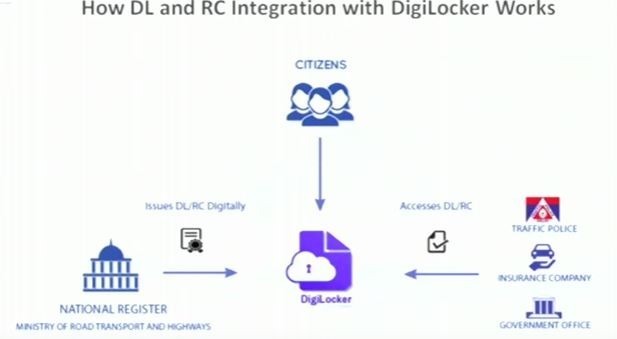 This will create your DigiLocker account. After your DigiLocker account is successfully created, you can provide your Aadhaar number (issued by UIDAI) to avail additional services, which includes upload on your Driving License and Registration papers. Once you have eSigned them and they are then ready to use. First and foremost, you will eliminate the need to carry any physical documents, which will save you hassle of losing or soiling them. Most importantly, they will serve as authentic digital documents which could be furnished when requested by Traffic Police, and Insurance company or any Government office for identification or any other purposes. If you have any questions or comments, do let us know in the comments section! "Now Carry Driving License & Registration Papers Digitally on Mobile Phones By Storing Them in DigiLocker App", 5 out of 5 based on 8 ratings. Apple launches iPhone 7 & 7 Plus, Coming to India on Oct 7; Overpriced yet again?